Tombigbee Waterway near Aber- dine, Miss. It will involve exca- vating and moving approximate- ly 8.5-million cubic yards of ma- terial on the historic waterway. The guidebook contains com- plete information on all of Cat- erpillar Marine's engines, trans- missions and generators. The guidebook includes a selection chart for the engines to assist the reader in the choice of engine for different applications. Photographs, specifications, drawings, and rating and fuel consumption charts are included for each of 11 CAT marine pro- pulsion models. Similar charts are included for the transmissions and the marine generator sets. CAT auxiliary engine ratings as specified by eight of the world's leading classification societies. Texas Gas Transmission Corpora- tion, according to an announce- ment by H.J. Bobzien Jr., divi- sion president. In his position as vice presi- dent, Mr. Stith will have respon- sibility for claims, insurance, per- sonnel, employee benefits, train- ing, safety, and other adminis- trative functions. Mr. Stith joined ACBL in 1965 as claims manager. He later held the positions of director of risk management and director of training and safety. In 1980, he was named assistant vice presi- dent and director of administra- tive services. Force 10 winds know that there are times when anything less than the best anchoring or mooring system is not good enough. And not good enough could be disastrous. They know they cannot afford to buy on price alone. Baldt has been the standard of the industry for 80 years. So much so, in fact, that other companies refer to some of their products as "Baldt" or "Baldt-type." 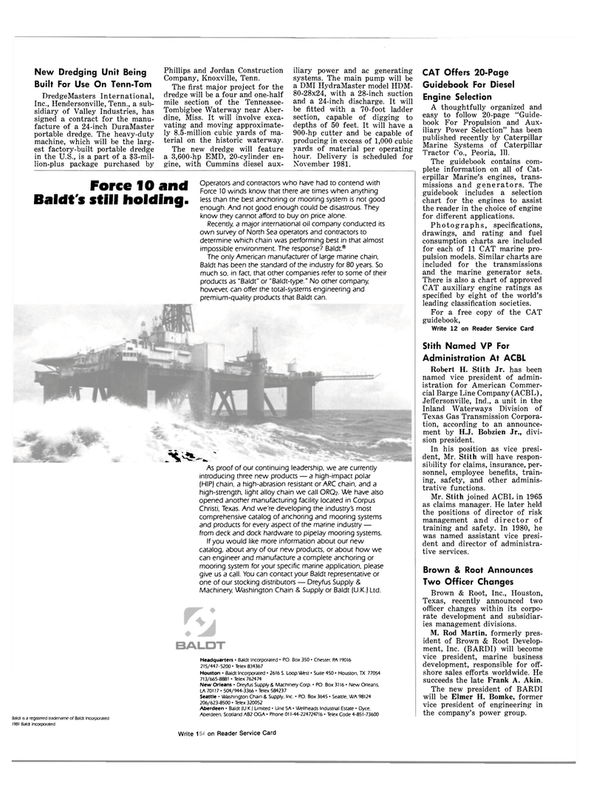 No other company, however, can offer the total-systems engineering and premium-guality products that Baldt can. New Orleans • Dreyfus Supply & Machinery Corp. • PO. Box 3116- New Orleans. Texas, recently announced two officer changes within its corpo- rate development and subsidiar- ies management divisions. M. Rod Martin, formerly pres- ident of Brown & Root Develop- ment, Inc. (BARDI) will become vice president, marine business development, responsible for off- shore sales efforts worldwide. He succeeds the late Frank A. Akin. The new president of BARDI will be Elmer H. Bomke, former vice president of engineering in the company's power group. Christi, Texas. And we're developing the industry's most comprehensive catalog of anchoring and mooring systems and products for every aspect of the marine industry — from deck and dock hardware to pipelay mooring systems.